Herbalists have long known that a healthy and unrestricted respiratory system, free from allergic reactions, is critical to optimal wellness, and that certain herbs work to support the respiratory system to help prevent periods of imbalance. 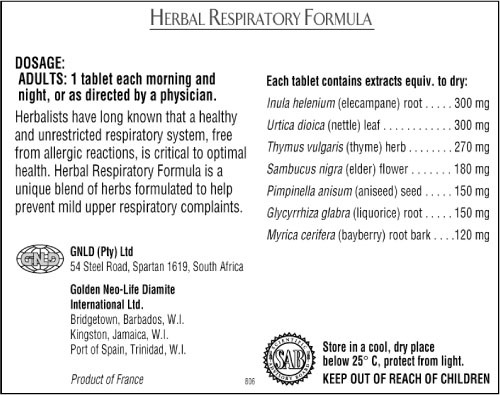 GNLD’s Herbal Respiratory Formula contains a unique blend of herbs to support balanced respiratory function. Why Choose Herbs to Support Respiration? Because herbs work naturally and gently to support normal respiratory function. Because herbs have been shown to help relieve mild upper respiratory complaints and help fight mild upper respiratory infections. 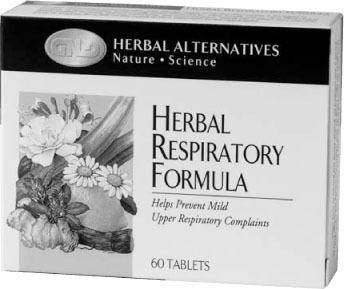 Why GNLD Herbal Respiratory Formula? Comprehensive formula. Our unique “complete family” approach to the formula provides broad, synergistic effects of the herbal constituents, which optimize their ability to support the function of the respiratory system. Contains Elecampane root, which has been shown to assist in promoting and supporting the function of the respiratory system, help relieve coughing and protect against recurrent respiratory infections. Contains Nettle leaf and Elder flower, which have been shown to help relieve minor symptoms of allergies and hay fever and soothe respiratory mucosa. (Inula helenium) Assists in promoting and supporting the function of the respiratory system, helps relieve coughing, protects against recurrent respiratory infections. (Urtica dioica) Promotes kidney function, assists in overcoming minor symptoms of allergies and hay fever. (Thymus vulgaris) Promotes vitality, reduces inflammation, helps relieve coughing, soothes respiratory mucosa. (Sambucus nigra) Reduces inflammation and mild fever, promotes kidney function, relieves mild symptoms of allergies and hay fever. (Pimpinella anisum) Promotes the function of the respiratory system, calms, helps relieve coughing. (Glycyrrhiza glabra) Reduces inflammation, promotes vitality, promotes and supports the function of the respiratory system and assists in protection from recurrent respiratory infections. (Myrica cerifera) Supports and calms the function of the digestive system, promotes the function of the circulatory system.